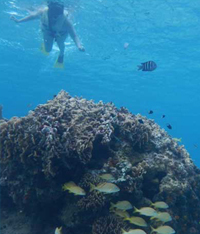 Why choose a private snorkel tour? It's simple. Avoid the cattle boats where you will be jammed in with your family uncomfortably, and then rushed through your snorkel! 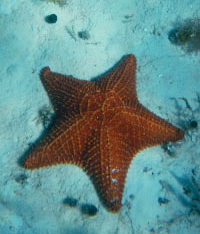 Cozumel has the most amazing reefs created by sponges, corals and seafans. Its home to over 250 species of fish, eels, turtles, sharks, rays & more. Our tropical waters have amazing visibility and the temperature is perfect to enjoy floating in the ocean. Come have fun and enjoy your day with us! Price listed is up to 6 guests. Additional guest is $30usd. Maximum up to 30 guests. 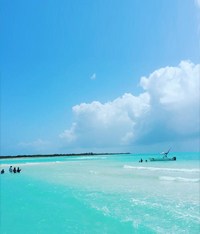 El Cielo is a shallow sandbar with turquoise blue waters, white sandy bottom and many starfish. To swim and play here, is of course, Heaven. 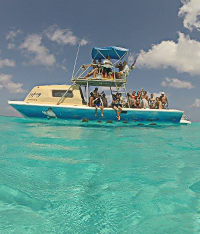 On our snorkel & cielo Cozumel, we offer 2 amazing snorkel sites and plenty time at El Cielo Sandbar where snacks and beers are served. Get all the best our island oceans have to offer in 1 trip. Departure times are flexible. This makes it perfect for groups / families on cruise ships schedules. Prices are quoted depending on group size. Every sunset is different. Each one is breath taking. All memories are beautiful. Our guests find that sunsets on the ocean are the highlight of their trip! The combination of Subwing + Sunset is perfect for a afternoon activity before dinner. We guarantee that everyone will enjoy this tour. To learn to Subwing, you just need to know how to swim. Its that simple! 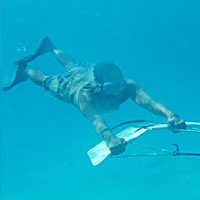 Subwing is like power snorkeling! Just pop on a mask, hold the board and fly underwater. If no one chooses to subwing, we will gladly stop and let you all jump into the ocean and float in these amazing crystal turquoise waters. 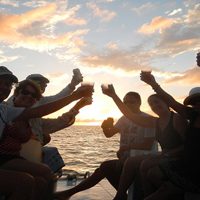 Our private sunset boat cruise takes place just in front of town (north) and the sail just takes 2 hours! Price is listed per person. A minimum of 4 is required for departure. View the video below for a quick sneak-peak of our subwing adventure! Want to rent a boat for something different? We can easily adapt to your needs! Just let us know what you would like to do, amount of hours and we will help you figure it out!